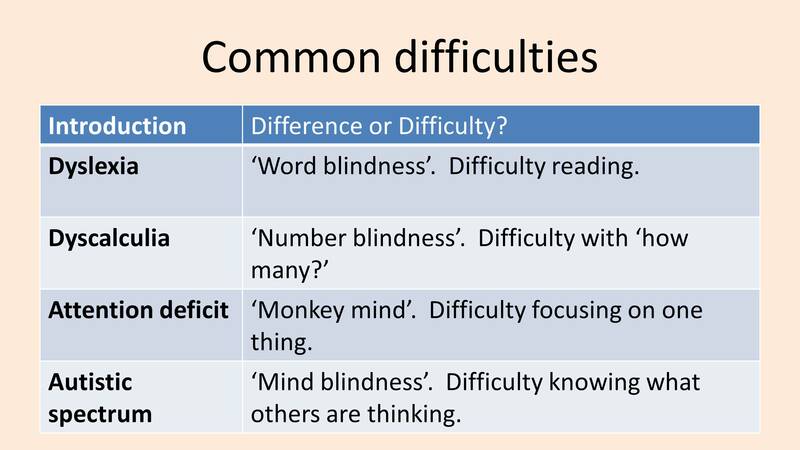 Using the idea of ‘Different Brains’ is another way of looking at what we often refer to as learning difficulties. We want to see how the brains of people with so-called learning difficulties are different, show how these skills can be improved, and to recognise some of the benefits of these differences. Note: this page is just an introduction aimed at classroom teachers. It does not claim to be comprehensive nor a training. problems with images appearing over the words. 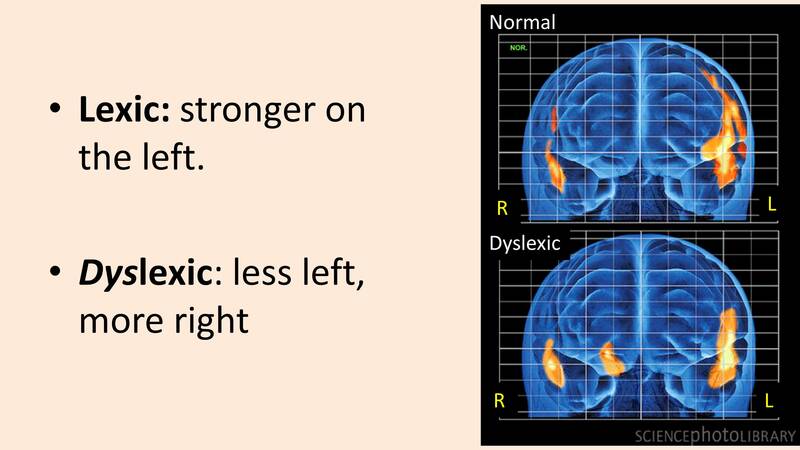 Often people who struggle with reading have strengths on the right side of the visual/spatial area of their brain (See ‘Dyslexic Advantage’), but are consequesntly weak on the left side which is used to decode the written work. While 3-5% of the population have a diagniosis for dyslexia, this simply means that they scored at a cerytain level on the assessment. However, a student who does not score at a level to be ‘diagnosed’ is still struggling. 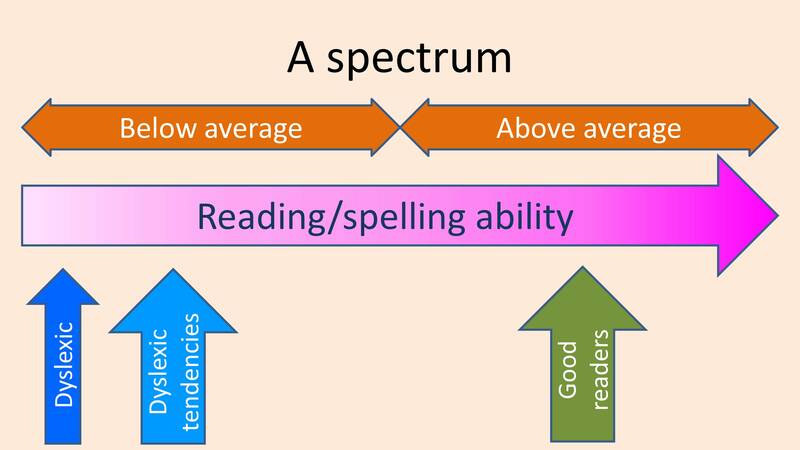 Teachers should assume that 40% of an average class will benefit from dyslexia-friendly habits. Keep the type face certainly not smaller than 12. Use a Sans Serif font, that is not a font with the curly bits, like Times, for instance. Don’t emphasise things by using capitals. People who are not very good at reading require the fall of the Y and the rise of the F in order to be able to identify the letter more easily. Use a coloured background. It’s not necessary to use bright yellow all the time, but you could use a beige, or even recycled paper that isn’t white. Experiment and see what’s helpful. Also, keep the line length short. Keep space between the paragraphs. Use bullet points rather than continuous text. Don’t justify the text on both sides of the page, leave it ragged on the right. 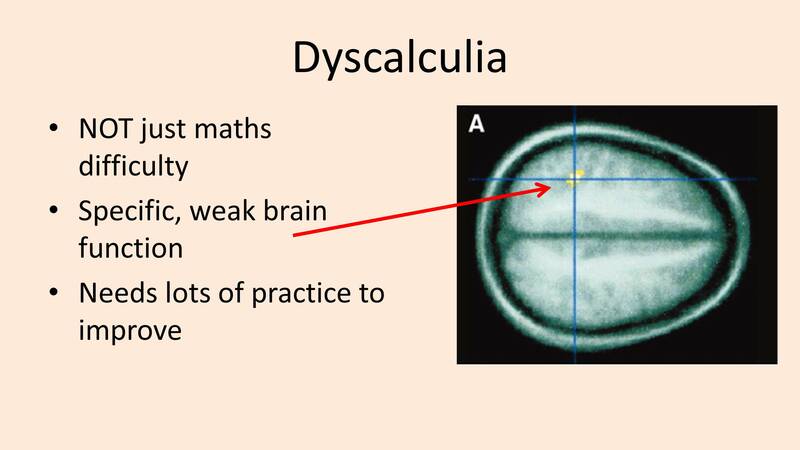 Dyscalculia is more than just difficulty doing maths. It is often associated with a weakness in two fundamental brain areas which deal with number. One tells us how many objects there are, without counting them (only works for small numbers! 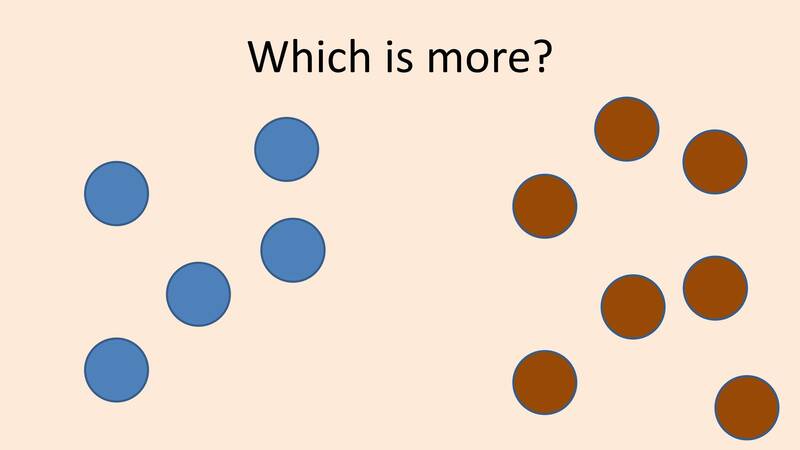 ), the other tells us whether one group has more objects, or is bigger than the other. To be ‘good at maths’ we need these primitive estimator areas to work well with the more advanced, learned areas which carry out the task of doing the calculation. This helps explain the difficulty teachers have with some students – however many times the maths is explained, the student still doesn’t ‘get it’. Like any learning difficulty, it is possible to help students with dyscalculia, but it requires action which is based on the understanding that a basic brain-function is weak. Simply ‘explaining it again’, or extra practice is not dealing with the underlying cause. There are two common versions: ADD, Attention Deficit Disorder and ADHD, Attention Deficit Hyperactivity Disorder. The main difference is that in ADD the student has difficulty paying attention, but is inactive, while in ADHD the student’s attention is easily drawn away from the task and they take action – moving, shouting out etc. ‘Attention’ is the ability to hold something in mind while you are thinking about it rather than be distracted by other events in the room or thoughts and feelings that arise. The part of the brain which keeps this control is in the very front of the brain is an area known as the Executive. 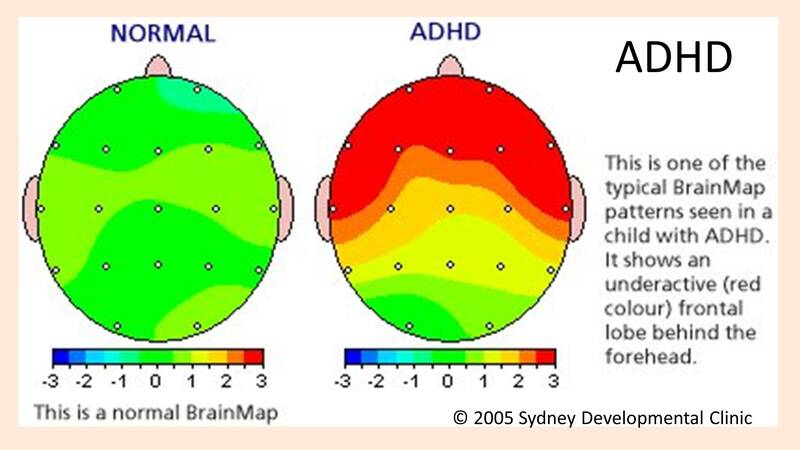 This scan opposite shows that this area is partly shut down in students with attention deficit so there is no control over basic urges. This area is also shut down with excess alcohol, so we see similar uninhibited behaviour from people who are drunk. This inactivity in the brain can be overcome with the use of stimulants such as Ritalin. The stimulant re-activates the control area and allows the student to pay attention. They are much less able to see that their action may be inappropriate. They may shout out things which are inappropriate, or do things which are inappropriate. Consequently we need to have clear rules and enforcement. When they’re taking this incorrect action, it’s not a logical part of the brain which is acting, it’s a primitive response. Consequently, talking to the student is often ineffective; there have to be clear consequences to their action. This section gives brief introduction to the sorts of autistuic behaviour teachers may encounter in mainstream schools. It is noit intended to introduce those forms of autuism which have a more severe impact on the student.